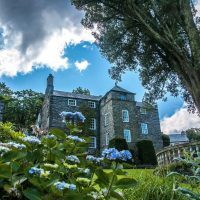 Plas Brondanw Gardens is owned and managed by the Clough Williams-Ellis Trust and is the estate where he lived with his wife. The estate is open to the public (obviously….I mean, we didn’t break in or anything) and admission is £4 per adult. In addition to walking around the gardens and checking out the varieties of flowers and plants, we paid a visit to the Café, where the perpetually hungry LT indulged in the most amazing pork and apple roll. You can’t beat a bit of company in the garden. After prising LT away from the Café, we headed up to the tower. The tower is located in a different location from the main gardens but is just a short walk away. You can climb to the top of the tower, but watch your step as it’s quite a tight space and the ceiling is rather low. We were fine because we’re too short for this to have any impact. Normal sized people, however, would definitely risk knocking themselves out on some stone. And a large bump on the head’s definitely not the kind of souvenir you want to take home, is it? Plas Brondanw is open on a seasonal basis, until September 30th. These are some of LT’s photos from the day. I’ve left out his lunch, just because. You can thank me later.